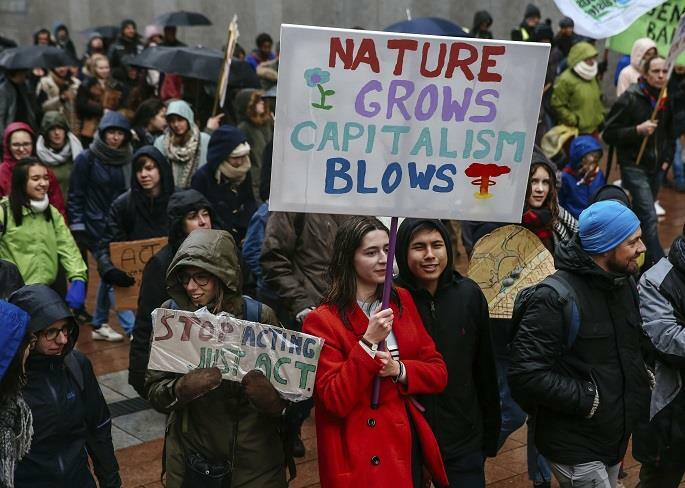 ​BRUSSELS, Jan. 27 (Xinhua) -- About 70,000 people took part in the 2nd "Rise for Climate" march on the rainy streets of Brussels on Sunday to pressure the Belgian government and the European Union to increase their efforts to fight climate change. The event was described as Belgium's biggest climate march ever, exceeding previous demonstrations held this month. The protest march began at 1.30pm from the Gare du Nord and the crowds arrived shortly after 3pm at the Place du Luxembourg, at the headquarters of the European Parliament, where a series of speeches and concerts were performed until 6pm. "Humanity is facing the greatest challenge it has ever faced on Earth, and it is imperative that we should make our politicians accountable!" cried the organizers in front of crowds of protesters. "The fight looks long and difficult, but we will not let go," they added. The protesters waved banners and placards smeared with all sorts of slogans, such as "No More Company Cars", "Act Now", "No time to waste". While 30,000 people arrived by train, many others joined the gathering by bicycle and on foot. This march follows an earlier demonstration of more than 65,000 people held in Brussels on Dec. 2, a date that coincided with the first day of the COP24 that opened in Poland, a major international meeting to discuss the fight against climate change. Since the beginning of this year, Belgian school children and students have also taken matters into their own hands. So far, they have organized a number of spontaneous marches and announced plans to keep holding demonstrations every Thursday, at the risk of skipping classes if necessary.